CJ Hockenbury has been around classic rock and rockabilly music his entire life. The influences started with Chuck Berry and Eddie Cochran before slipping into modern influences like Muse, Rise Against, Royal Blood and Ghost. His mashup of influences, along with his bandmates, became the unique sound of Calling Kings. Hockenbury went from playing and writing classic 50s music to more aggressive, modernized songs before joining forces with Rick Sepulveda and Mythias Del. Once the three of them got together, the emotion and power of the songs really came into fruition. They’re a band that isn’t interested in record labels or various powers of management, and they prove that with their latest single, “Demon Suit”. It’s a song that discusses a side of the entertainment industry that can be viewed as a taboo topic, but fits in to their mentality of speaking their minds. As they created the song, it was one that they kept going back to and adding more layers. By the time it was finished, it was a no-brainer that this would be their next single. It’s a song about the amount of hardships artists have to endure, especially when they become taken advantage of. It was only a matter of time before someone addressed the topic in the form of a song, Hockenbury said, and they wanted to be part of that conversation. 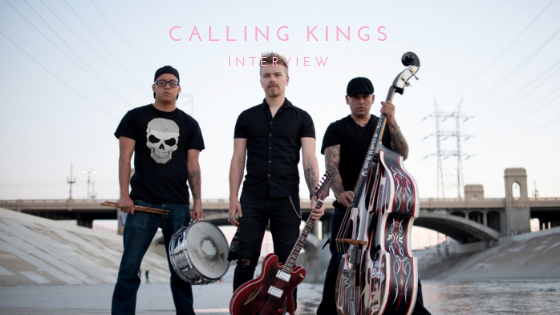 Without that fear of saying the wrong thing or being what is deemed as normal, Calling Kings brings a message to their music that better resonates with their audience. As they continue to take their show on the road, they strive to be as true as the sounds of their greatest influences.